Lighting that is not appropriate for computer work is a major factor in visual discomforts such as eyestrain, burning or itchy eyes, headaches and blurred or double vision. Bright light on the display screen "washes out" images making it difficult for operators to clearly see the work. 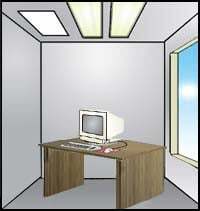 Use light diffusers so that desk tasks (writing, reading papers) can be performed without direct brightness on the computer screen. Place rows of lights parallel to the operator's line of sight. Use operator adjustable task/desk lighting. If diffusers or alternative lights are not available, removing the middle bulbs of 4-bulb fluorescent light fixtures can also reduce the brightness of the light. Use blinds or drapes on windows to eliminate bright light. 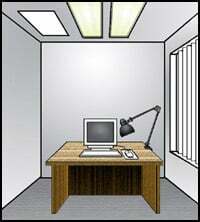 Blinds should be adjusted during the day to allow light into the room, but not directly into the operator's field of view (Fig. 2). Lamps should have glare shields or shades and the line of sight from the eye to the light should be at an angle greater than 30 degrees. Reorient the work-station so that bright lights from open windows are not in the field of view. (Fig. 2). Use indirect or shielded lighting where possible and avoid intense or uneven lighting in the field of vision (Fig. 2). monitor placed at different angle. High contrast between light and dark areas of the computer screen, horizontal work surface, and surrounding areas. For computer work, well-distributed diffuse light is best. The advantages of diffuse lighting are two-fold: There tend to be fewer hot spots, or glare surfaces, in the visual field, and the contrasts created by the shape of objects tend to be softer. Use light, matte colors and finishes on walls and ceilings in order to better reflect indirect lighting and reduce dark shadows and contrast.